This is “Web Exercises”, section 12.7 from the book Beginning Project Management (v. 1.1). For details on it (including licensing), click here. Locate commodities in online catalogs. Use an RFQ template obtained online. Use an RFP template obtained online. Describe and interpret D&B financial reports using definitions from the D&B website. Commodities can be purchased from online catalogs if the buyer knows exactly what is needed for the task. Open a blank document in a word processing program and then save the document as Ch12CommoditiesStudentName.doc. Leave the document open. Use your web browser and go to http://www.eastmfg.com. The catalog is provided in PDF format. This format is not easily changed by the viewer. Click the Parts menu and then click the link to the Hardware Catalog shown in Figure 12.11 "Parts Catalog". In the Search box, type Lynch Pin and then press Enter. Refer to Figure 12.12 "Searching for a Part". The price is not listed. Separate price lists are often maintained for different classes of customer, and discounts are usually available for large orders. There is a unique catalog number for each type of anchor. This number is used for placing orders. The part's capacity, size, and weight are provided. Some labels require knowledge of the product to understand; for example, Side Swing Pin. Capture this screen and paste it into Ch12CommoditiesStudentName.doc. At the bottom of Ch12CommoditiesStudentName.doc, write between one hundred and two hundred words to describe how to navigate and interpret an online catalog that is provided in PDF format. Commodities can be services that are specifically defined and common enough to have standardized descriptions and quality. In this exercise, you download a template for writing an RFQ from the state of Massachusetts for requesting quotes on testing software for accessibility compliance. Open a blank document in a word processing program and then save the document as Ch12RFQStudentName.doc Leave the document open. Use your web browser to type http://www.mass.gov/dep/recycle/reduce/rmrfq.pdf. Scroll to the Preface page, as shown in Figure 12.13 "Description of RFQ Template". Add this web address to your browser’s bookmarks or favorites list in the Project Management folder. Capture a screen that shows the address in the Project Management folder in the favorites or bookmarks and then paste it into Ch12RFQStudentName.doc. Scroll through appendices at the end of the document. Capture a screen from one of these appendices pages and then paste it into Ch12RFQStudentName.doc. At the bottom of Ch12RFQStudentName.doc, write between one hundred and two hundred words to describe the advantages of using a template. Make specific reference to at least two sections of the RFQ template used in the first part of this exercise, including page references. If you need to rely on the vendor’s experience and expertise to solve a problem, you can request companies to submit proposals on how they would go about it. The state of Maryland provides a template for RFPs. Open a blank document in a word processing program and then save the document as Ch12RFPStudentName.doc. Leave the document open. 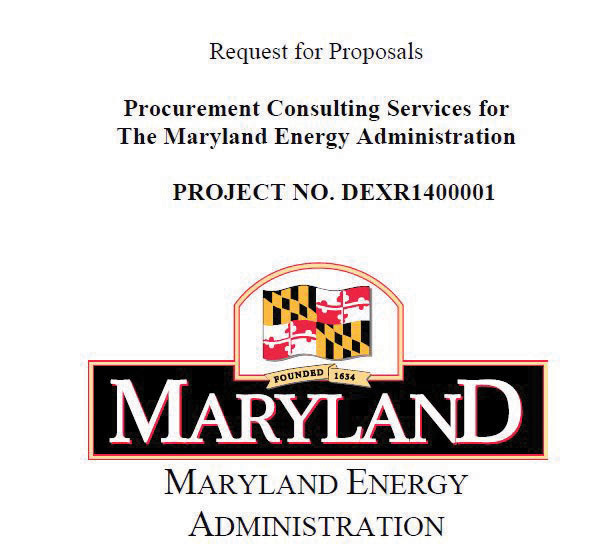 In a browser, type http://energy.maryland.gov/documents/ProcurementConsultingServicesRFPFINAL.pdf. 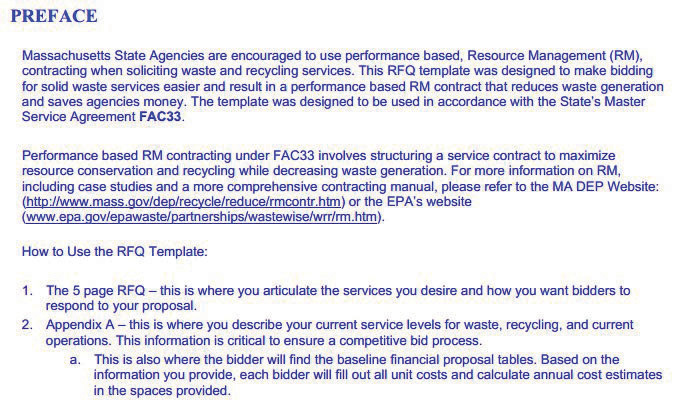 An RFP template used by the Maryland Energy Administration displays as a PDF file, as shown in Figure 12.14 "Source of RFQ Template". Source: Courtesy of Maryland Energy Administration. Add this web address to your browser’s bookmarks or favorites in the Project Management folder. Capture a screen that shows the address in the Project Management folder in the favorites or bookmarks and then paste it into Ch12RFPStudentName.doc. Scroll to section 1.7 Pre-Proposal Conference. Observe that many organizations give contractors an opportunity to meet and ask questions before they prepare a proposal. Scroll back to page ii, Project No. Observe that the state asks the contractors who decide not to bid to explain why. Capture the screen that shows the list of reasons why the contractor chose not to bid, and then paste it into Ch12RFPStudentName.doc. Explore the other sections of this RFP template and choose one that is new to you or that you find most interesting. At the bottom of Ch12RFPStudentName.doc, write between one hundred and two hundred words to describe what you learned from each of the three sections: the pre-proposal conference, the refusal to bid, and the third section of your choice. Make specific reference to each of the three sections of the RFP template used in Part I including page references. The relationship between the project and its suppliers and vendors involves trust that both parties will keep their financial commitments. This trust may be based on past experience, but it can also be based on a third party’s rating of the financial health of the organization and its past behavior. For example, organizations with better credit ratings can negotiate lower prices with suppliers and vendors because there is less risk. One of the most popular rating agencies is D&B. In this exercise, you locate and review the types of financial reports that are available from D&B. Open a blank document in a word processing program and then save the document as Ch12DBStudentName.doc. Leave the document open. In a browser, type http://www.dnb.com/us/customer_service/scores.html. The D&B web page displays, as shown in Figure 12.15 "D&B Ratings". © Dun & Bradstreet, Inc. Capture a screen that shows the address in the Project Management folder in the favorites or bookmarks and then paste it into Ch12DBStudentName.doc. Scroll down the page to the D&B Rating Interpretation table. The rating in the first column indicates the worth of the company, and the numbers 1 through 4 indicate its general credit worthiness, where 1 is high and 4 is low. For example, a rating of 1A-4 indicates a company with a worth between $500,000 and $749,999 with a low credit worthiness rating. Capture this screen and paste it into Ch12DBStudentName.doc. Scroll down to the US Employee Range Designation table. Notice this rating indicates the number of employees, where ER1 is more than 1,000. Scroll down to the D&B PAYDEX Value table. Observe that the PAYDEX score indicates when the company pays its debts. Notice that paying off debts sooner than is contractually required earns a PAYDEX score above 80. Scroll down to the Financial Stress Score table. Notice that companies with a score of 1 are estimated to have a probability of failure of .03 percent (3 per 10,000) of failing in the next twelve months, while a rating of 5 means a probability of failure of 4.7 percent (almost 1 in 20). At the bottom of Ch12DBStudentName.doc, write between one hundred and two hundred words to describe the function of these four tables.